It’s been amazing to watch the resurgence in Image Comics in the past couple years. They’ve always been a well-regarded publisher, but Image went a long time with just a few hit series, and the rest of their catalog filled out with low-profile comics plagued by delays and cancellations. I suspect that a combination of factors helped them out: The contraction in the comics industry pushed most people out of the “independent” business, and Image is the only major publisher build around experimentation and creator rights. And despite that contraction, interest in comics as a medium beyond superheroes has been growing, with Image providing a safe, accessible gateway to that world. Whatever the reason, the number of small press titles I’m reading has dropped to an all-time low, while the Image ones keep increasing. Also interestingly, many new Image titles are bucking the miniseries trend that has otherwise dominated comics outside of DC and Marvel. Plenty of Image series have become hits (Invincible, The Walking Dead, and even newer ones like Morning Glories), and it’s a path that other creators apparently want to follow. In fact, I’ve started reading so many new Image series this year that I’ll need more than one First Look article to go through them all. Here is the first. After enjoying James M. Cain’s The Postman Always Rings Twice, I watched the 1946 movie version of it. There have been other adaptations, but this is generally regarded as the best. After watching it, I’m not sure why. If anything, it gave me a twisted sort of relief to know that Hollywood was ruining books even back then. The contrast between the book and the movie is evident right away. The novel begins with Frank Chambers getting thrown out of a truck, trying to steal food, and ending up with a job after ascertaining that his new boss is a sucker with a hot wife. Portrayed in the movie by John Garfield, Chambers is a neatly-dressed man who just walks up to a restaurant to take a job. His only nod to character building is an awkward speech about how his “wandering feet” might not let him stay. Lana Turner plays Cora Smith, not Cora Papadakis. The movie took out the racial elements probably not out of concern for Greek sensibilities, but to avoid a mixed-race relationship. Her husband Nick was defined almost entirely by this in the book, and actor Cecil Kellaway was left with no material to build a character with. He’s a foolish pushover with no clear motivations, and the heavily character-based drama suffers for it. Ironically, the attempts to clean the characters up actually make them seem like worse people. With the mistakes of Cora’s past removed, her marriage made bland, and her new affair equally passionless, her only apparent motivation for murder is to move up in the world. It’s understandable that the studio would want to make this movie palatable for a mass audience, but the book was a success because of its sleazy characters and raw passion. Without that, there wouldn’t be much reason for it to exist. The resulting movie is solidly within our expectations for a film of the 1940’s. I understand why it was popular then, but it hasn’t aged well at all. It’s stilted, self-censored, and features a few baffling mistakes. (For example, the D.A. tries to break Frank by referencing an event that had happened in the book but had been omitted from the movie.) The novel, despite being over a decade older, has aged wonderfully due to its focus on believable characters. There’s nothing wrong with a work being of its time. Most of the things I review positively, for example, will be less interesting ten years from now. I would expect a reviewer then to judge them fairly based on the standards of that time. By the same reasoning, there’s really no reason left to watch The Postman Always Rings Twice. Brave is about a princess who doesn’t want to have to be a princess. Ironically, it’s the first Pixar movie that really feels like it wants to be a Disney movie. It features inspiring musical interludes and characters one step removed from the traditional funny sidekick. Even the central gimmick of rebelling against the princess lifestyle is less subversive than it’s made out to be; In reality, Princess Merida’s wonderful life is entirely due to her royal family. All her needs are met, she’s surrounded by servants who are never presented as equals, and her main complaint is that all that leisure time can’t take up 100% of her life. It’s a pity this couldn’t be bolder, because the novelty of featuring (gasp!) a girl in a starring role raised a lot of people’s hopes. This may not have everything I hoped for, but I think it still does more good than harm for gender roles in movies. That’s because, even though it features a princess, this is still unmistakably a Pixar film. The visuals are stunning, even more for their design sense than the technical underpinnings, and the characters are given believable human emotions instead of stock lines. Pixar’s writing strength has always been in applying that depth to simply-defined characters, though, and this approach rings a little hollow here. Merida and her parents are the only characters not defined by a single quirky characteristic, and in line with their royal privilege, everyone else seems to exist only to be laughed at. Fortunately, the relationship with the parents is the focus of the movie. Even if Merida’s mother and father are taken directly from modern sitcom archetypes, those Pixar emotions make them worth caring about. Brave’s plot will surprise no one, but it doesn’t always take the easy path. It’s willing to portray Merida as a bit selfish, and a couple scary scenes are very bold for a children’s movie. The Celtic culture never feels as well-defined as Pixar’s made-up worlds of talking cars and fish, though the beautiful landscapes and exotic touches are satisfactory for a fantasy movie. If this review seems to be going back and forth a lot, then you have an accurate impression. The Pixar magic is definitely still here, but for the first time in years, it feels like they’re coasting along on habit instead of taking chances. 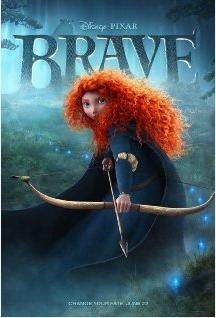 A very good movie for kids and an enjoyable one for adults, Brave will entertain you for the evening. Just remember to hold it up to normal movie standards rather than those set by Toy Story and The Incredibles. My recent comic reviews have focused mainly on “First Look” reviews of new series, and I’ve fallen behind on reviewing some existing ones. Here are my looks at the latest chapters of several independent (or at least non-superhero) ongoing series. Most of these are actually miniseries that pick up where earlier miniseries left off. That has become the trend for independent comics lately. Most people are unlikely to start reading unless they have a “#1” to reassure them on the cover of an issue, and the delay between miniseries also gives creators a chance to take a break for a few months, either to take on other work or to build a buffer on the next series. As I said in my Origins re-cap, Friedemann Friese’s Friday is the first deck-building game since Dominion to truly work, and it does this by not trying to copy Dominion at all. Most notably, you don’t hold a hand of cards. After choosing a challenge to fight against, you draw a certain number and see what total strength they provide. Winning gives you that card in your hand – half of the card describes the challenge, while the other half has a fighting strength or special power to use later. If the drawn cards aren’t enough to win, you can either pay a health point to draw another, or you can give up, losing one health per point that you lost. But these losses are an important part of your strategy, because for each health lost in this way, you can trash one drawn card. 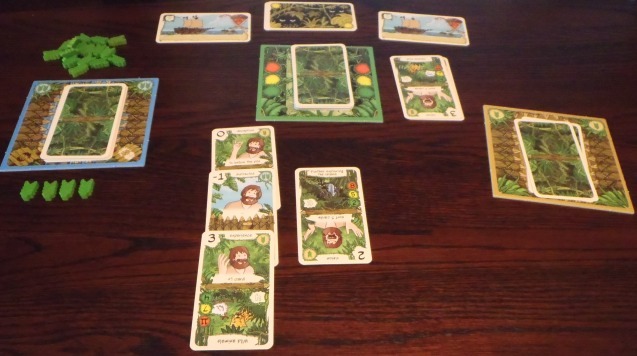 With a theme based on Robinson Crusoe, you start the game very healthy, but weak. The goal is to get rid of the bad cards you start with and gain stronger ones, essentially turning into a tough survivalist who is just a few accidents away from death. Every time you go through your deck, a bad “aging” card gets shuffled in, adding another threat to stay on top of. The deck-building mechanic isn’t the only clever aspect, though. Friday is also a solitaire game. While some new games come with optional solitaire rules, this is the first modern one I’ve seen intended only for one player. As such, it’s a little difficult to judge. One friend I loaned it to pointed out that the various things you needed to keep track of felt too fiddly, and he’d rather use a computer if he’s playing solitaire. Personally, I thought the fiddliness was much easier to handle when I’m just counting points and special abilities in my head instead of justifying them to the table. Obviously, though, opinions about Friday will depend on factors different from multiplayer games. I will say, though, that if you want a strategic solitaire game, this seems like the right approach. It’s inexpensive, can be packed in a purse or laptop bag, and plays in about thirty minutes. (If you lose, it may end more quickly.) On top of that, the four difficulty levels keep the game challenging but winnable for all players, as well as making sure that you experience the full arc of the gameplay in those early learning games. The gameplay is streamlined but offers some worthwhile choices. Like a good deck-builder should, Friday works because its strategy involves more than just taking whatever you can. That 0-strength card that lets you draw two more for free is pretty good in the late game, but useless in the beginning when the cards it draws will probably also be 0s. Balancing the need for fighting strength with the cool powers that some cards have is a major tension, even more important than the balance between destroying bad cards and retaining health. I don’t see this becoming a Dominion-style juggernaut. You play with the same cards every time, get the chance to put almost every card in your deck, and I haven’t found a better strategy than the one that I figured out early on. But there’s a good deal of replay potential within that strategy, and I can play Friday at times when other board games just aren’t an option. Friday is a good game regardless, but if I also give it credit for filling a new niche and doing deck-building right, then this is obviously a must-play. Four months ago, DC’s Vertigo imprint launched four new comics. I’m not reading one of them (the Fables spin-off Fairest didn’t interest me, since I don’t read the main title), and New Deadwardians is a mini-series that I’ll review once it ends. (I’ll provide a spoiler, though: You should be checking it out.) The other two are ongoing, so it’s time for my first look reviews. The one I like will receive further reviews down the line. For the other one, this will have to be my final say.